Background: L-ASNase (L-asparagine aminohydrolase EC 3.5.1.1) is used for the conversion of L-asparagine to L-aspartic acid and ammonia and also it was found as an agent of chemotherapeutic property according to recent patents. It is known as an anti-cancer agent and recently it has received an immense attention. Various microorganisms have the ability to secrete the L-ASNase. It is famous world-wide as anti-tumor medicine for acute lymphoblastic leukemia and lymphosarcoma. L-ASNase helps in deamination of Asparagine and Glutamine. Source: L-ASNase mainly found in two bacterial sources; Escherichia coli and Erwinia carotovora. Isolation from plants: Endophytes were also a great source of L-ASNase. It was isolated from four types of plants named as; C. citratus, O. diffusa, M. koengii, and also P. bleo. Applications: L-ASNase is used as a potential anti-tumor medicine. It plays a very much essential role for the growth of tumor cells. Tumor cells require a lot of asparagine for their growth. But ASNase converts to aspartate and ammonia from asparagine. So the tumor cell does not proliferate and fails to survive. The L-ASNase is used as the medicine for the major type of cancer like acute lymphocytic leukemia (ALL), brain. It also used as a medicine for central nervous system (CNS) tumors, and also for neuroblastoma. Two types of L-ASNase have been found. 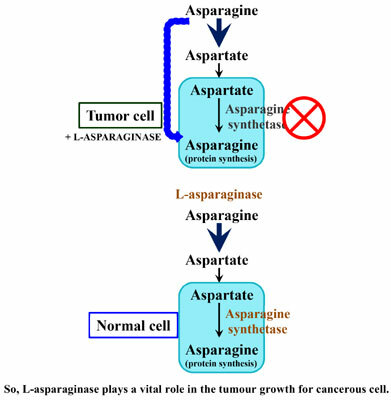 Conclusion: L-ASNase becomes a powerful anti-tumor medicine and researchers should develop a potent strain of asparaginase which can produce asparaginase in the industrial level. It is also used in the pharmaceutical industry and food industry on a broader scale. L-ASNase, enzyme, isolation, purification, microorganisms, anti-tumor medicine.